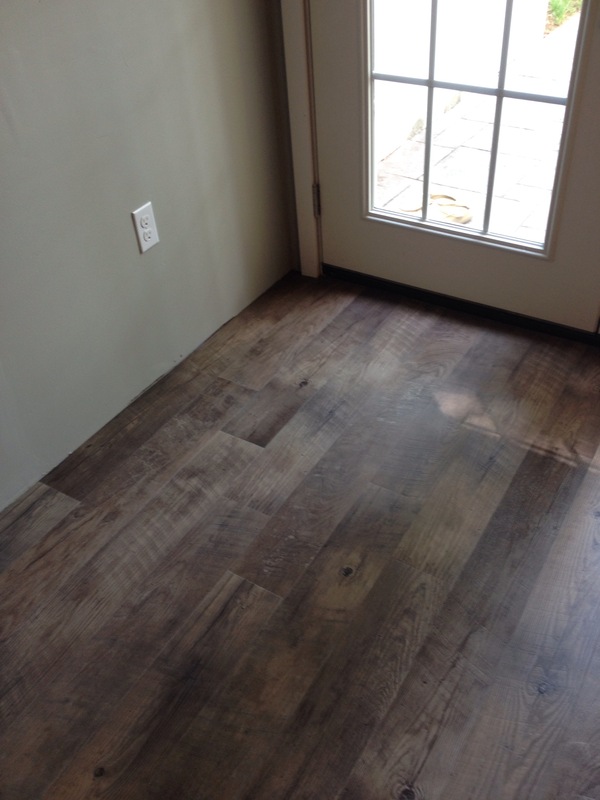 Mannington Adura Vinyl Plank Flooring–I’m in love! I know it’s been a while since my last post. I’ll skip over the details for now and fill you in later on my cottage living journey. But I wanted to jump right back in to my blog to tell you about something. I’m almost finished installing a new floor in my new studio, and I’ve fallen madly in love with Mannington Adura Vinyl plank flooring! Oh how I love thee, let me count the ways! 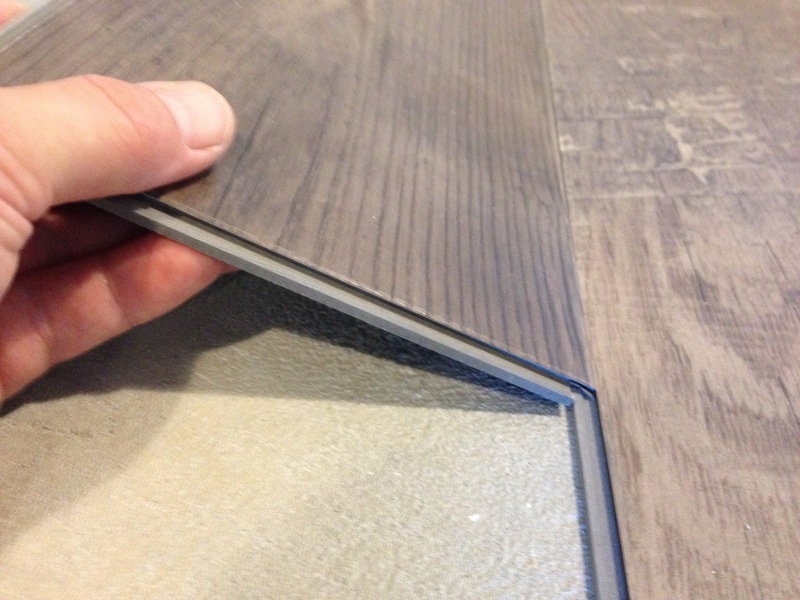 First, the options in vinyl flooring today look amazing. 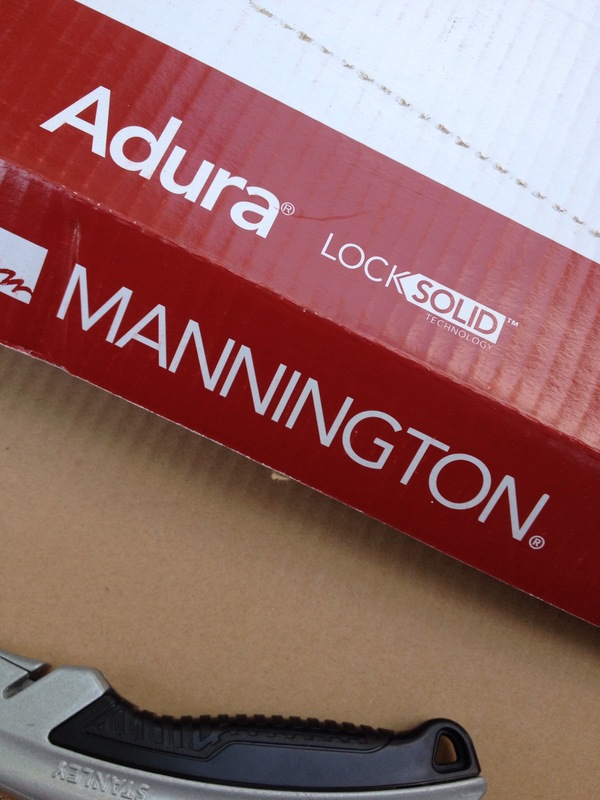 I’ve had my eye on the Dockside line from Mannington after seeing pics online, but I didn’t think I could afford it. I started to look for some alternatives online, but after visiting a local carpet and flooring store, i realized if I factored in the potential shipping from an online store, I really could afford to buy it locally and install it myself. So it’s georgous…and affordable! I choose the Driftwood design, and it looks like worn beach or barn wood. Perfect for the shabby-chic art studio! I’m about 3/4 finished with the install, but this has been so easy to install. They use something called Lock Solid Technology, and each vinyl plank clicks and locks into the adjoining planks. Couldn’t be easier, and feels nice and solid. I think there is a version that glues down, but I’m doing a floating install. Check when you order it, because some designs come in glue and floating versions, but there may be some that are glue-down only. I can’t speak for durability so soon after installing, but I’ll keep you posted on how well this flooring wears. I’m anticipating it will wear very well. my dog Mollie likes it too! Let me know what you think. The next steps will be trim, and then picking out and installing a section of base cabinets, counter, and sink. I’m so excited to finally have an art studio with some natural light, and a terrific floor as well. Your floor is beautiful! I’ve been researching this flooring online & looking for installed pics of this floor. I’ve heard of negative comments, regarding sunlight affecting the floor & causing warping. Just curious, how well has the floor held up? The floor still looks great! I haven’t noticed any color change from sunlight. My studio is located in a walkout basement area with French doors. It gets some sun, but not intense or long term amounts of sunlight, if that would make a difference. The material is vinyl, so it hasn’t warped. I will say that it is somewhat like rolled linoleum because if your base floor underneath has some uneven spots, you may feel that thru this floor. I like that it’s a bit flexible because I had some uneven spots in my poured concrete floor, and this flooring adapted to this slight change. I would definitely use this kind of flooring again. It’s easy to install, and I only wish I had more floors to do in my house! Thanks for answering! 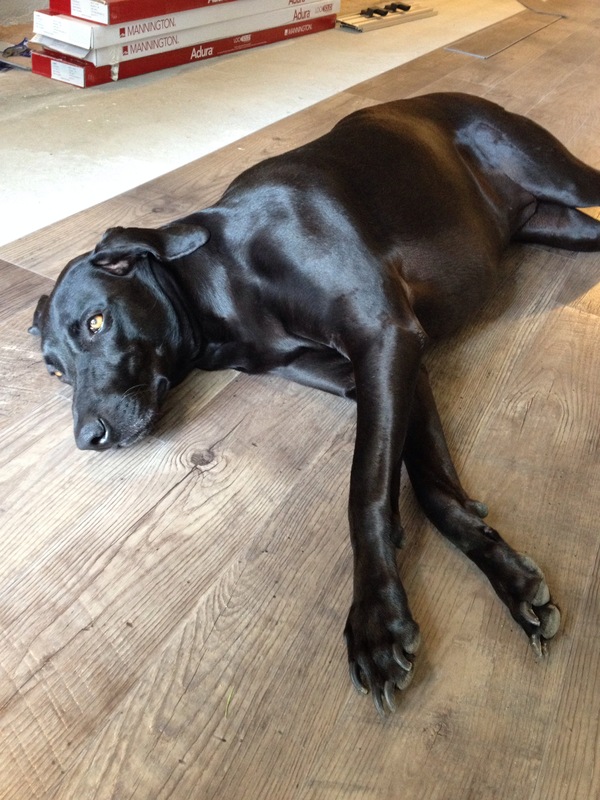 One more ?, do you remember which color flooring this is? The Adura Dockside has several diff colors in the line. I love the colors in your floor. Its nice to see an installed floor & not just a small sample. The pattern/color is “Driftwood”. I would really recommend doing this if you have the chance…go to a local flooring/carpet store and see if they have large samples that you could borrow. 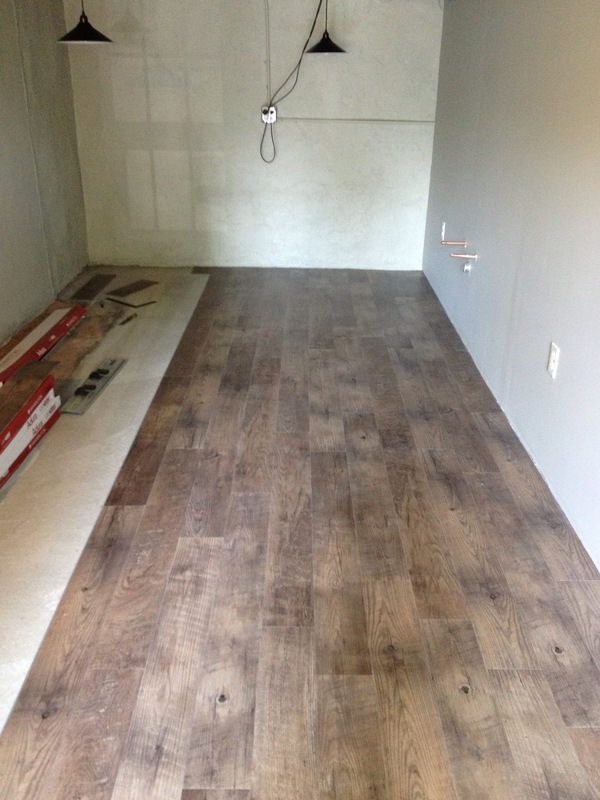 Many stores will lend you several flooring samples to take home and see how they look in your environment. I didn’t think I needed to do this, but I was glad I did. My first color pick turned out to not be my favorite once I saw all of the samples in the room. The wall color and also lighting can greatly affect how the flooring is perceived. Hope this helps with your room! Good luck decorating…It’s always a lot of fun, but also can be stressful! Stay calm and have fun and enjoy the process and great results will follow!